Crack cocaine (crack) is a free base form of cocaine that can be smoked. It offers a short but intense high to smokers. The Manual of Adolescent Substance Abuse Treatment calls it the most "addictive" (effective) form of cocaine. Crack cocaine is commonly used as a recreational drug. 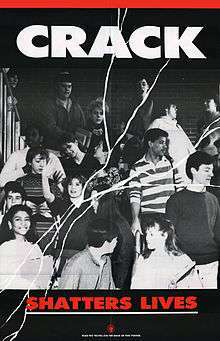 Crack first saw widespread use in primarily impoverished inner city neighborhoods in New York, Los Angeles, and Miami in late 1984 and 1985; its rapid increase in use and availability is sometimes termed as the "crack epidemic". Toxic adulterants: Many substances may have been added in order to expand the weight and volume of a batch, while still appearing to be pure crack. Occasionally, highly toxic substances are used, with a range of corresponding short and long-term health risks. Adulturants used with crack and cocaine include milk powder, sugars such as glucose, starch, caffeine, lidocaine, benzocaine, paracetomol, amphetamine, scopolamine and strychnine. 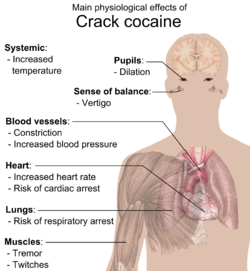 Smoking problems: Any route of administration poses its own set of health risks; in the case of crack cocaine, smoking tends to be more harmful than other routes. Crack users tend to smoke the drug because that has a higher bioavailability than other routes typically used for drugs of abuse such as insufflation. Crack has a melting point of around 90 °C (194 °F), and the smoke does not remain potent for long. Therefore, crack pipes are generally very short, to minimize the time between evaporating and ingestion (thereby minimizing loss of potency). Having a very hot pipe pressed against the lips often causes cracked and blistered lips, colloquially known as "crack lip". The use of "convenience store crack pipes" - glass tubes which originally contained small artificial roses - may contribute to this condition. These 4-inch (10-cm) pipes are not durable and will quickly develop breaks; users may continue to use the pipe even though it has been broken to a shorter length. The hot pipe might burn the lips, tongue, or fingers, especially when passed between people who take hits in rapid succession, causing the short pipe to reach higher temperatures than if used by one person alone. Some people previously believed that crack cocaine caused SIDS, but when investigators began looking at the incidence of SIDS in the children of women who used crack cocaine, they found it to be no higher than in children of women who smoked cigarettes. An appreciable tolerance to cocaine’s high may develop, with many addicts reporting that they seek but fail to achieve as much pleasure as they did from their first experience. Some users will frequently increase their doses to intensify and prolong the euphoric effects. While tolerance to the high can occur, users might also become more sensitive (drug sensitization) to cocaine's local anesthetic (pain killing) and convulsant (seizure inducing) effects, without increasing the dose taken; this increased sensitivity may explain some deaths occurring after apparent low doses of cocaine. 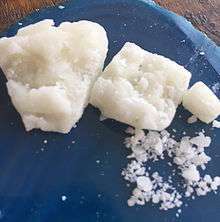 Crack cocaine is frequently purchased already in rock form, although it is not uncommon for some users to "wash up" or "cook" powder cocaine into crack themselves. This process is frequently done with baking soda (sodium bicarbonate), water, and a spoon. Once mixed and heated, the bicarbonate breaks down into carbon dioxide and sodium carbonate, which then reacts with the hydrochloride of the powder cocaine, leaving cocaine as an oily free base. Once separated from the hydrochloride, the cocaine alkaloid floats to the top of the now leftover liquid. It is at this point that the oil is picked up rapidly, usually with a pin or long thin object. This pulls the oil up and spins it, allowing air to set and dry the oil, and allows the maker to roll the oil into the rock-like shape. ↑ Reinarman, Craig; Levine, Harry G. (1997). "Crack in Context: America's Latest Demon Drug". In Reinarman, Craig; Levine, Harry G. Crack in America: Demon Drugs and Social Justice. Berkeley, CA. : University of California Press. 1 2 3 4 5 6 7 8 9 10 11 12 13 14 15 16 "DEA, Drug Information, Cocaine", United States DOJ Drug Enforcement Administration, 2008, webpage: DEA-cocaine. 1 2 White Mischief: A Cultural History of Cocaine, Tim Madge, 2004, ISBN 1-56025-370-3, link: , p. 18, at Google Books. 1 2 3 "Life or Meth - CRACK OF THE 90'S", Salt Lake City Police Department, Utah, 2008, PDF file: Methlife-PDF. 1 2 3 4 5 6 7 8 A.M. Costa Rica, July 2008, Crack rocks offer a short but intense high to smokers. 1 2 "Officials warn of life-threatening cocaine in area", Stacy O'Brien, Red Deer Advocate, December 2008, webpage: reddeer-officials: notes cocaine with the worming medicine levamisole. 1 2 Scheidweiler KB, Plessinger MA, Shojaie J, Wood RW, Kwong TC (2003). "Pharmacokinetics and pharmacodynamics of methylecgonidine, a crack cocaine pyrolyzate". J. Pharmacol. Exp. Ther. 307 (3): 1179–87. doi:10.1124/jpet.103.055434. PMID 14561847. Retrieved 2008-02-24. ↑ Yang Y, Ke Q, Cai J, Xiao YF, Morgan JP (2001). "Evidence for cocaine and methylecgonidine stimulation of M(2) muscarinic receptors in cultured human embryonic lung cells". Br. J. Pharmacol. 132 (2): 451–60. doi:10.1038/sj.bjp.0703819. PMC 1572570 . PMID 11159694. ↑ Fandiño AS, Toennes SW, Kauert GF (2002). "Studies on hydrolytic and oxidative metabolic pathways of anhydroecgonine methyl ester (methylecgonidine) using microsomal preparations from rat organs". Chem. Res. Toxicol. 15 (12): 1543–8. doi:10.1021/tx0255828. PMID 12482236. ↑ Cole, Claire; Jones, Lisa; McVeigh, Jim; Kicman, Andrew; Syed, Qutub; Belis, Mark A. (2010). Cut: A Guide to Adulturants, Bulkinh Agents and other Contaminants found in Illicit Drugs. Centre for Public Health, Liverpool John Moores University. pp. 6–25. 1 2 "A Rose With Another Name: Crack Pipe", Allan Lengel, The Washington Post, April 5, 2006, webpage: highbeam-576: states "four-inch-long tube that holds the flower" and "Convenience stores, liquor stores and gas stations...sell what the street calls 'rosebuds' or 'stems' for $1 to $2". 1 2 Mégarbane, B; Chevillard, L (5 December 2013). "The large spectrum of pulmonary complications following illicit drug use: features and mechanisms". Chemico-Biological Interactions. 206 (3): 444−51. doi:10.1016/j.cbi.2013.10.011. PMID 24144776. 1 2 3 4 "Delusional Parasitosis", The Bohart Museum of Entomology, 2005, webpage: UCDavis-delusional. ↑ Okie, Susan (2009-01-27). "The Epidemic That Wasn't". The New York Times. ↑ "Growth, Development, and Behavior in Early Childhood Following Prenatal Cocaine Exposure, Frank et al. 285 (12): 1613 — JAMA". Jama.ama-assn.org. 2001-03-28. Retrieved 2010-12-22. ↑ NIDA - Research Report Series - Cocaine Abuse and Addiction Archived September 26, 2007, at the Wayback Machine. ↑ "Preventing Poisoned Minds", Dennis Meredith, Duke Magazine, July/August 2007, webpage: DM-17. ↑ "Street Drugs and pregnancy". March of Dimes. Retrieved 2009-05-26. ↑ Morgan, John P.; Zimmer, Lynn (1997). "Social Pharmacology of Smokeable Cocaine". In Reinarman, Craig; Levine, Harry G. Crack in America: Demon Drugs and Social Justice. Berkeley, Ca. : University of California Press. ↑ Reinarman, Craig; Waldorf, Dan; Murphy, Sheigla B.; Levine, Harry G. (1997). "The Contingent Call of the Pipe: Bingeing and Addiction Among Heavy Cocaine Smokers". In Reinarman, Craig; Levine, Harry G. Crack in America: Demon Drugs and Social Justice. Berkeley, Ca. : University of California Press. ↑ Kinzie, Erik (April 2009). "Levamisole Found in Patients Using Cocaine". Annals of Emergency Medicine. 53 (4). Retrieved 2009-08-18. ↑ "Single Convention on Narcotic Drugs, 1961" (PDF). International Narcotics Control Board. Archived from the original (PDF) on 2008-05-09. Retrieved 2008-05-01. ↑ "DEA, Title 21, Section 812". Usdoj.gov. Archived from the original on 2008-08-22. Retrieved 2008-09-05. ↑ 21 U.S.C. § 812(b)(2) Retrieved 2008-05-01. ↑ Sterling, Eric. "Drug Laws and Snitching: A Primer". PBS. Retrieved 20 May 2013.